If treatment for gout in toe requires surgical removal of tophi, something has gone seriously wrong. Unfortunately, grotesque photographs and videos of tophi being removed from the big toe are far too common. I will subject you to more gruesome pictures soon, just to emphasize the point. You should prevent gout getting to this stage, and avoid treatment for gout that involves surgery. Do not assume you automatically get the treatment you need to avoid surgery. In the gout case report where I found the photographs, there is an indication that uric acid levels were not being managed properly. The patient had a history of gout, was being prescribed allopurinol, yet uric acid was 6.4mg/dL. The advice from rheumatologists for safe uric acid levels is 5mg/dL or lower. 6.4 is not outrageously high, but in the colder regions of the big toe, it is far from safe. There is a further complication in this gout case study, as it features Viagra (sildenafil). The link between gout and Viagra is discussed occasionally and mentioned on pack inserts, yet the evidence for a link is very unreliable. People often try to link unrelated health issues, and when that is reported in clinical trials, it has to be included in product information. However, there is nothing to suggest in any reports that this is anything other than coincidence, coupled with a very poor understanding of gout. 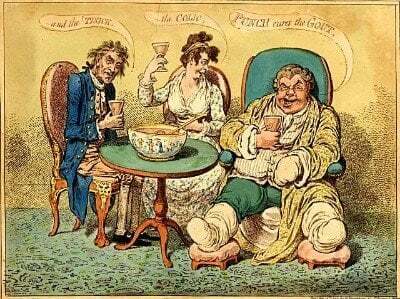 Anyway, that is not the issue here, so let me return to consider this dramatic treatment for gout in toe. Tophi in big toe prior to removal by surgery. This gout case study is titled Gouty arthritis at interphalangeal joint of foot after sildenafil use. It concerns a 58 year old male with a history of gout, high blood pressure, and heart disease. He was admitted to hospital after two months of pain, and difficulty wearing his shoe. Mobility was limited due to pain and swelling in the big toe. Appropriate treatment for gout in the toe was determined to be surgery. Blood supply to the toe was restricted, and the tophi removed. Examination of the chalky white material revealed uric acid crystal deposits. Tophaceous gout may lead to significant morbidity and, if untreated, can cause joint erosion and destruction. The tophaceous material may present in a liquid, pasty, or chalky/granular state. Treatment may be as simple as aspirating the liquid or squeezing out pasty tophaceous material. Surgery is often indicated for the patient with significant tendon and joint compromise as well as skin breakdown. Read more about tophi removal in the treatment for gout guidelines. I have had in my lifetime 3 gout attacks I guess. I am 58 years old, a male with stage III kidney disease and recently have had I guess gout for over a month now. I went to a podiatrist who just looked at it after telling my story and he said I have gout. No blood tests for uric acid levels because he said some patients have high levels and don’t have gout and other have low levels and have it. He said come back if the pain continues and he will give me a cortisone shot. But I still feel like its Morton’s Neuroma and not gout. My pad of my foot just is so tender and redness on top of my foot near the 3rd and 4th toes. Can anyone tell me if they have had pain this long? The most important thing you must do is to see a rheumatologist. I never heard of a podiatrist who understands gout, and I’ve heard some dangerous nonsense from more than 1. Your podiatrist’s explanation of gout and uric acid levels is a clear indication that he does not know what he is talking about. A good rheumatologist will provide a proper diagnosis, so you can get treatment before you suffer serious joint damage, or make your kidneys worse. Certainly, anyone who suspects gout with kidney disease must see a rheumatologist. If, after conducting proper tests, your rheumatologist also suspects Morton’s Neuroma, he might refer you to a neurologist.